We all want our design portfolios to be worthy of Architectural Digest. And, of course, the largest contributing factor to a stunning interior shot is a stellar interior design job. But the icing on the cake is in the styling and photo editing. Today on the blog, we’re revealing seven little secrets designers, stylists, and photo editors use to capture that magazine-ready look. 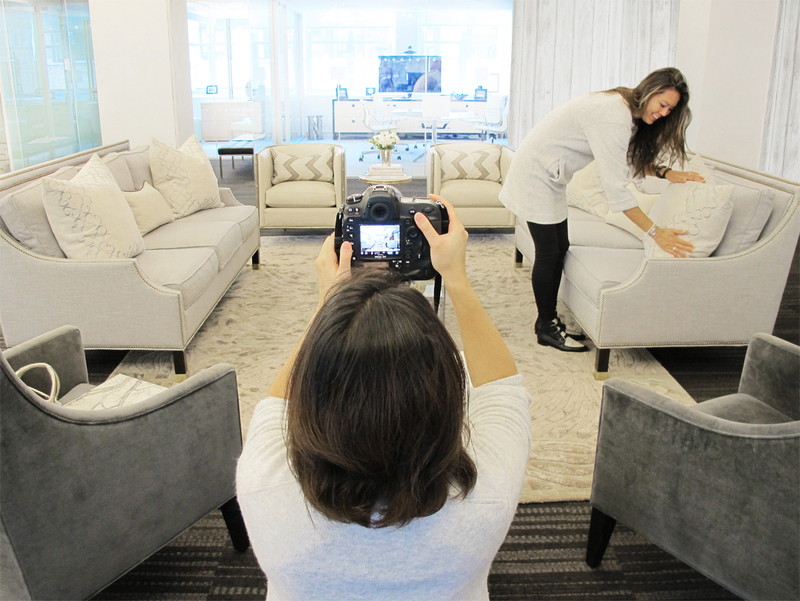 So whether you’re a designer prepping your portfolio or you’re just working to create an enviable Instagram feed, read on for a behind-the-scenes scoop on making interior design photos look fabulous. Doing a bedroom photoshoot? Ever wonder how some beds manage to look impossibly cozy? One easy trick is to sneak an additional down comforter underneath the bedding you already have in place for an extra layer of “plump and fluff.” It’s a small move, but it’ll create a dreamy and ultra-comfy look that’ll catch the eye. We also wrap pillow inserts in extra batting to make them look super full and rotund. Fluff your pillows out and add a nice chop down the middle, and you’re all set. Grab your nearest shelter magazine, and take a look at the cover. We’ll make a bet that you won’t find any light switches, outlets, air vents, or other distracting eyesores. Have a photo editor (or DIY) strip out all of the ordinary and “unattractive” things on your walls. With a simple Photoshop cleanup, you can achieve that clean, uncluttered look in any room you photograph. Just take a look at the before and after above! 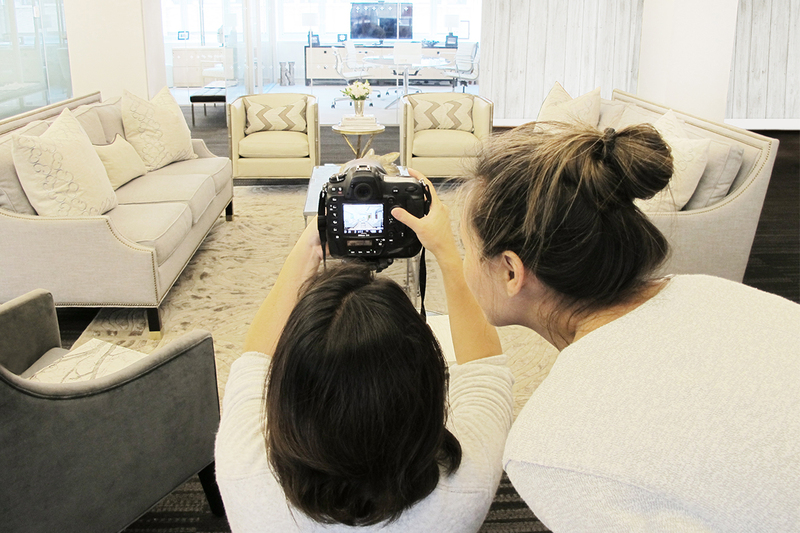 If you work in interiors, you know that the trickiest aspect of getting a great photos is the lighting. Depending on reflections, shadows, natural sunlight and other lighting factors, the colors and brightness of a space can often look distorted. Once we get our first round of photos, we typically spend some time correcting the colors of paint and furniture to more accurately depict their real colors. There are also some times when we don’t like the color or pattern of something, and we’ll completely alter the color altogether. And almost always, we’ll brighten the image just a few decibels to give it that light, bright, and sun-filled look. We love our lighting selection at Kathy Kuo Home, and if you’ve read our lighting guide, you’ll know that we advocate for multiple sources of light in a room, from task lighting to accent lights to a large chandelier. But when styling a room, sometimes the placement for a lamp looks best in an area far from any actual outlets. In fact, turning lights on often negatively effects the lighting of a space for photography. So most prop lamps aren’t plugged in, and any cords are hidden from sight (and sometimes Photoshopped out from the final image if need be). A little secret about all of the gorgeous homes you read about in the shelter magazines: the crazy beautiful views are almost always digitally altered. In reality, the view may be the wrong season or have the wrong weather (have you ever seen an editorial photo of a house with a thunderstorm going on outside through the windows?). 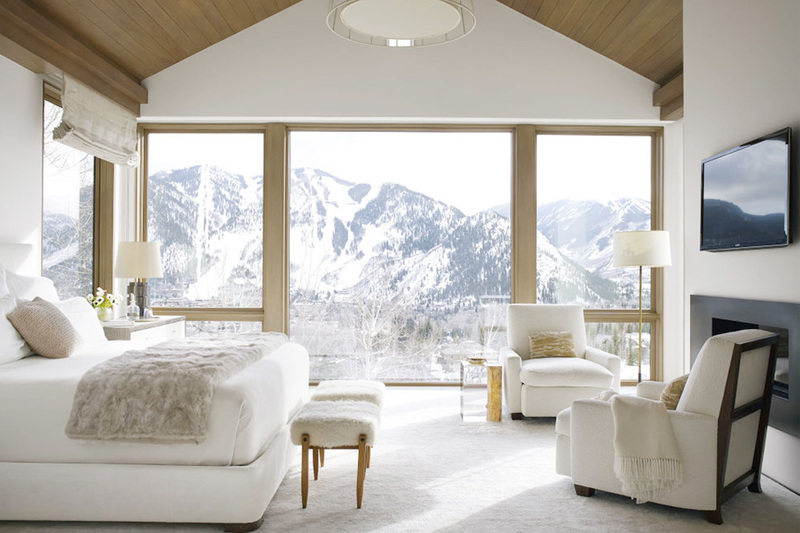 And sometimes the view just isn’t as inspiring as the home itself, so we’ll place in a location that seems fitting. Photographing rooms with mirrors can also be tricky because there’s often a photographer or an undesirable background in the reflection. So we also use photo editing to place in a clean and appealing view. 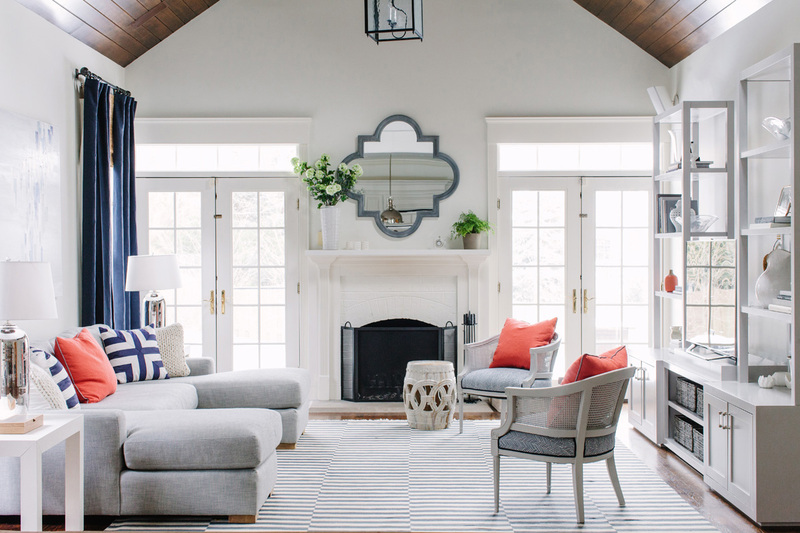 If your home doesn’t look as picture perfect as the homes in magazines, don’t fret. Stylists spend hours steaming drapery, throw pillows, chair skirts, sheets, etc. all for that one moment the camera flashes. A real, lived-in home does not look like a magazine. That’s just the facts. Cheating gets you nowhere in life…unless it’s getting you that perfect photo. When you’re taking a picture, it’s important to remember that although you might be seeing everything, your audience is only going to see what’s in the frame. Cheat chairs slightly inward to face the camera. 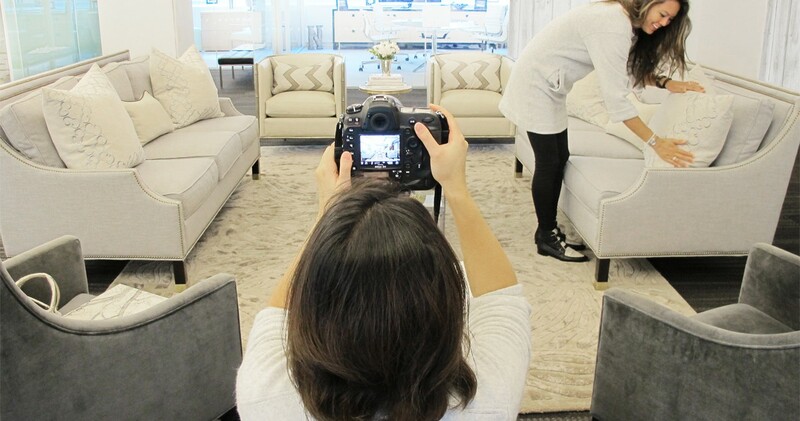 Move furniture to appear centered or aligned in the shot, even though it might not be the actual center of the room. And if we have a piece of decor like a big bowl or tray, we often stuff the bottom of the vessel with spare newspaper or styrofoam to prop up the flowers or whatever decor is inside. In short, whatever the camera can’t see… doesn’t hurt. What tricks do you use when photographing your home or design work? Start a conversation in the comments below! Great article! I especially LOVE the double-stuffed bedding tip, as well as editing out outlets and such. Overall though, my real delight came from the courage and honesty to plainly state the important role altering and editing photos often play. I really think I needed to hear an expert I admire say that it’s ok to edit your images! Hi Caitlin! So glad you enjoyed the article! All the best!! Great suggestions. I had a job where the walls and curtains were great but the outside view was not good and the client stuck a horrible modern piano in the bay… that was impossible! Hi Bronwen, thanks for reaching out. We’re happy you found the article helpful!